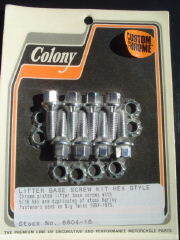 Chrome Big Twin lifter base screws with 1/4" X 24" Thread. One set fits Big Twins 1936-1953, HD 45’s 1937-1973 is countersunk and slotted. Replaces OEM # 2329. Another set fits Big Twin 1954-1975 has a hex head and is also countersunk, this is the set that is pictured. Replaces OEM # 18660-53. Colony Stock #'s 8102-16 and 8604-16.